Light Emitting Diodes (LEDs) are highly efficient at producing optical radiation (light) directly from electrical current passing through them. However, as with other electrical devices, LEDs also convert a small part of the input electrical power as heat. Unless this thermal loss is dissipated, it is impossible to ensure reliable and stable LED operation and exploit the complete performance and efficiency of the LEDs. Designers have solved the problem of dissipating heat from LEDs by using metal core PCBs. LED applications today use several types of PCB technologies, such as FR4 PCBs with thermal via array, thick copper PCBs, Aluminum metal core PCBs, and Copper metal core PCBs. Of these, designers and manufacturers prefer to use the FR4 PCBs with thermal via array and Aluminum metal core PCBs. FR4 is the most commonly used PCB materials, and a flame-retardant epoxy laminate characterizes it. However, this method of construction gives the FR4 very low thermal conductivity. If you were to calculate the through-plane thermal resistance for a 1.6 mm thick FR4 board of approximately 270 mm2 area, using standard values, you are likely to arrive at approximately 30 °C/W. Considering a smaller size for the heat source, closer to that of an LED say 3.3 x 3.3 mm, you will find the one-dimensional thermal resistance will increase to over 700 °C/W, making it almost impossible to keep the LED junction temperature within operational limits. One of the inexpensive ways designers improve the thermal resistance of FR4 PCBs is by adding thermal vias. They place plated through holes (PTH) connecting the two conductive layers. By adding PTH vias appropriately, designers can improve the thermal resistance of an FR4 board. A single via of 0.6 mm diameter, which is solder-filled, has a thermal resistance of 96.8 °C/W, provided the heat source is directly normal to the thermal via. Increasing the number of thermal vias helps to improve the thermal resistance considerably. For instance, five 0.6 mm solder-filled vias will cause the thermal resistance of our earlier 270-mm2 board to fall to 12 °C/W, an improvement of over 60% from its initial value. Note that open vias result in a higher thermal resistance as compared to that from filled vias, because the area normal to the heat source reduces for the former. Metal-core PCB manufacturers fabricate their boards differently. 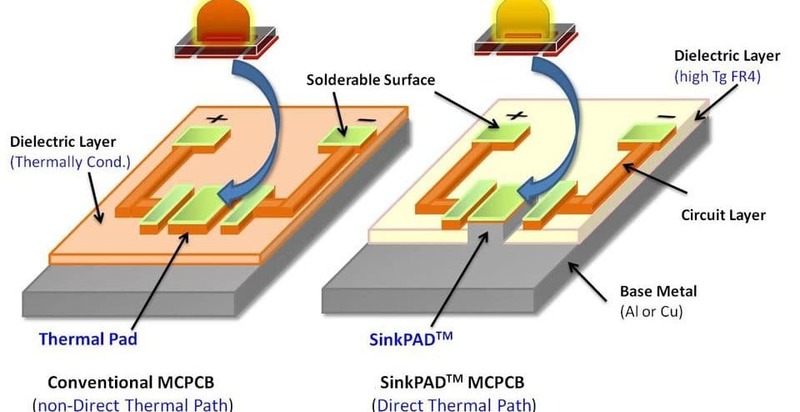 Examining a simple one-layer MCPCB reveals solder mask, a top copper circuit layer, a thermally conductive dielectric layer, and the metal core base layer, usually an Aluminum substrate. The fabricator laminates and bonds the three layers together, thereby providing a path for the heat to travel through and dissipate. Although designers commonly use Aluminum as the metal substrate, you may come across steel and copper substrates as well. Using the same dimensions as earlier, you can calculate the thermal resistance of a metal core PCB to be 0.2 °C/W, for a 1.6 mm thickness and board size of 270 mm2. 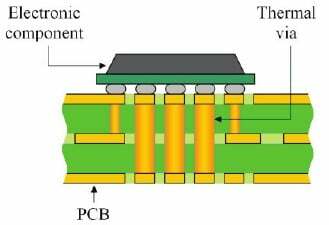 Again, considering the heat source to be 3.3 x3.3 mm as earlier, the thermal resistance of the PCB will increase to 5.3 °C/W. Even so, this is an improvement of more than two times over the thermal resistance of an FR4 PCB with thermal vias. The limiting factor for metal PCB core materials is the PCB dielectric. In addition to offering vastly superior heat dissipation over the material for standard circuit boards, metal core PCB material also offer superior thermal expansion, along with significantly better dimensional stability. With metal core PCB design, you can have higher power density, better electromagnetic shielding, and improved capacitive coupling. 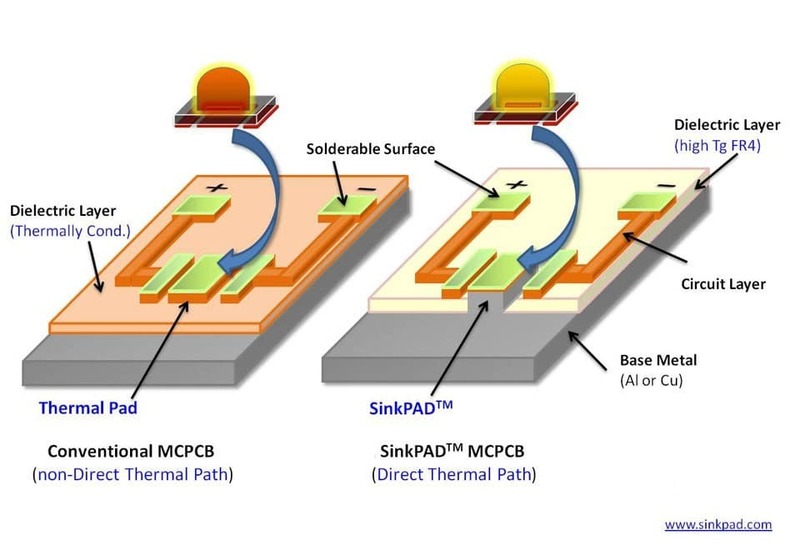 Although designers do not need to use thermal vias for metal core PCB prototypes, designers sometimes use them to improve on the thermal performance. As copper has better thermal characteristics than aluminum does, engineers prefer copper metal core PCB LEDs where they have to house high wattage LEDs in small enclosures. Metal core Printed circuit boards manufacturers selectively remove dielectric material to expose the base metal for attaching the LED chip. The direct thermal path improves performance by reducing the thermal resistance even more. Metal core Printed circuit boards manufacturers use MCPCB for thermoelectric separation applications. They place the microchip or die in direct contact with the metal core, which helps in heat dissipation. They electrically interconnect the traces of the circuit board with wire bonding. 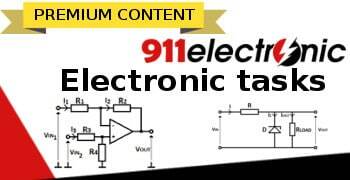 This allows them to achieve thermal conductivity of over 200 W/mk for the COB MCPCB. Metal core PCBs greatly reduce board space while replacing other components such as heat sinks. Mounting of other components such as power transistors becomes easier, as the presence of the metal substrate allows elimination of grease, mica, and rubber insulators under the power devices by mounting them directly on the metal substrate. Elimination of the insulating hardware improves heat transfer. Designers can eliminate whole sections of printed wiring boards’, thereby eliminating interconnects, by using etched traces on the metal core PCBs. 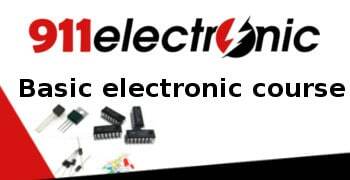 They can also replace many discrete devices at the board level by using power and passive devices of the surface mount type. Apart from use in LED lights, you can find metal core PCBs being used in several other applications. For instance, the size constraints and watt-density requirements of DC-DC converters force engineers use metal core PCBs, as they are available in a variety of thermal performances, are compatible with mechanical fasteners, and are highly reliable. It is possible to use the metal core PCBs in various form factors and manufacturers can fabricate substrate metals in a wide variety, and with different thicknesses and copper foil weights. Automotive, audio, motor control and power conversion applications are increasingly using metal core PCBs, as they offer several advantages that include superior attachment capabilities, surface mount assembly, and excellent thermal performance. Fabricators often selectively remove the dielectric and form the metal core with 3-D features making the metal core a versatile substrate. The material construction of the metal core PCBs allows mounting configurations suitable for solid-state relays in several control applications, which is not possible with ceramic substrates. Metal core PCBs offer thermally efficient and mechanically robust construction that a solid-state relay construction demands. Manufacturers are discovering new types of metal core PCB material, especially dielectrics, to meet the high thermal performance expectations that can even out-perform existing ceramic-based designs. 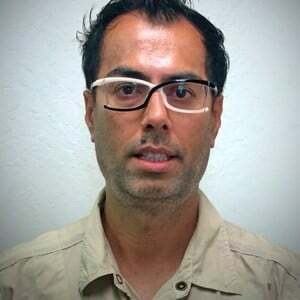 Roy Akber, CEO RUSH PCB, Inc.
Akber Roy is the CEO of RUSH PCB Inc. Akber Roy has 20 years of experience of electronic contract manufacturing. 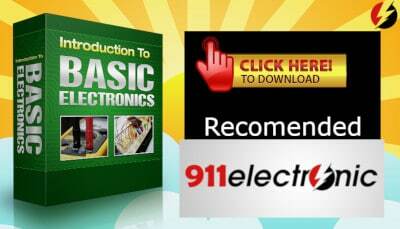 RUSHPCB Inc provides detailed printed-circuit-board development resources. Charger that could wirelessly recharge your phone and tablet at once?